Why you’re there: You just realized that 1% of the population controls 17% of the nation’s wealth and you’re pissed off about it. …currently accepting applications for running mates. I’d prefer somebody who is a pacifist, an idealist and a watcher of E! This entry was posted on October 30, 2011 by letsgrabacoffee. 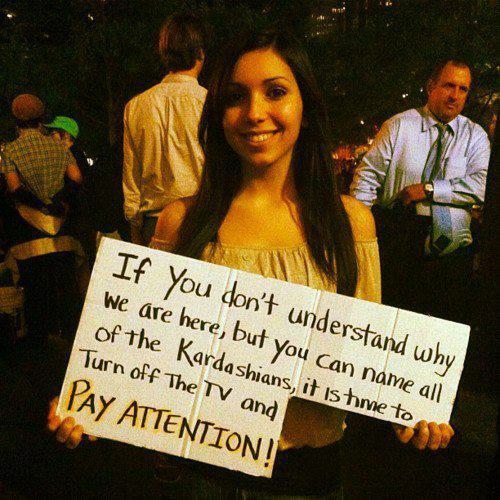 It was filed under Just Sayin' and was tagged with kardashians, occupy wall street. You even went the extra step and listed them in order from oldest to youngest, good job! I will vote for you just for that! You know what’s sad? I didn’t even do that on purpose. I’m just THAT good (cough, pathetic, cough).